Connect your Google Ads account to HubSpot to manage your Google ads in HubSpot's ads tool. In the left sidebar menu, navigate to Marketing > Ads. In the Accounts tab, click Connect account. In the dialog box, select Google Ads. If you have multiple Google Ads accounts, a list of your accounts will appear. Select the account(s) you want to connect to HubSpot, then click Connect. Only individual Google Ads accounts can be connected to HubSpot. Google Ads manager accounts cannot be connected to HubSpot, so any Google Ads account being managed in a manager account should be connected to HubSpot individually. The HubSpot user who connects a Google Ads account must have Publish access to the ads tool in HubSpot. The HubSpot user who connects a Google Ads account must have Admin access for that account. In your Google Ads account, you can check the access level for any user by clicking the Tools dropdown menu and selecting Account access. Multiple Google Ads accounts can be connected to HubSpot, but each account needs to be connected by the same HubSpot user. 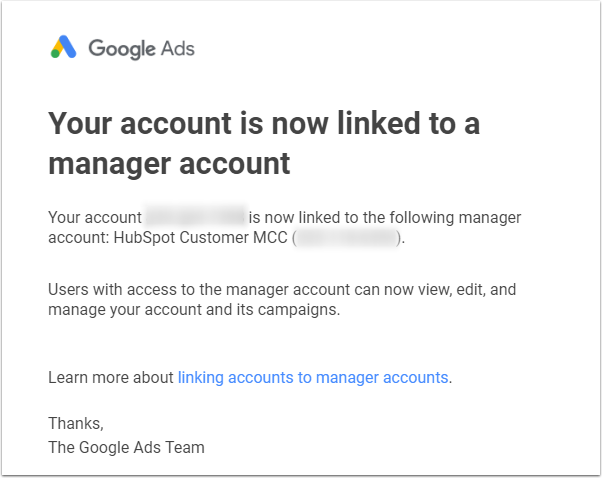 If you already have a connected Google Ads account and want to connect an additional Google Ads account to HubSpot, the HubSpot user who connected the original account must connect the new account. In the pop-up window, log in to your Google account using the email address associated with your Google Ads account, then click Allow. Once you've connected your Google Ads account, you'll receive an email notifying you that your Google Ads account is linked to the manager account HubSpot Customer MCC. A manager account is a Google account that allows HubSpot to monitor and track advertising performance across users' ads accounts. Linking your Google Ads account to HubSpot's manager account also allows HubSpot to escalate issues regarding your account to Google, grants you the ability to create audiences for your Google ads in HubSpot's ads tool, and makes you eligible for beta products and other benefits that Google makes available to HubSpot customers. Linking your Google Ads account to HubSpot's manager account is not necessary for the core contact tracking and reporting functionality in HubSpot's ads tool. Learn how to unlink HubSpot's manager account (HubSpot Customer MCC) from your Google Ads account. The Google Ads account will appear in your Ads Accounts settings in HubSpot.